Home / News / 2017 Summer GEM Alumni Mag Photo Caption Contest! Technology, Innovation, and Entrepreneurship are strongly rooted in GEM's culture … but what fuels innovation better than a little friendly competition? 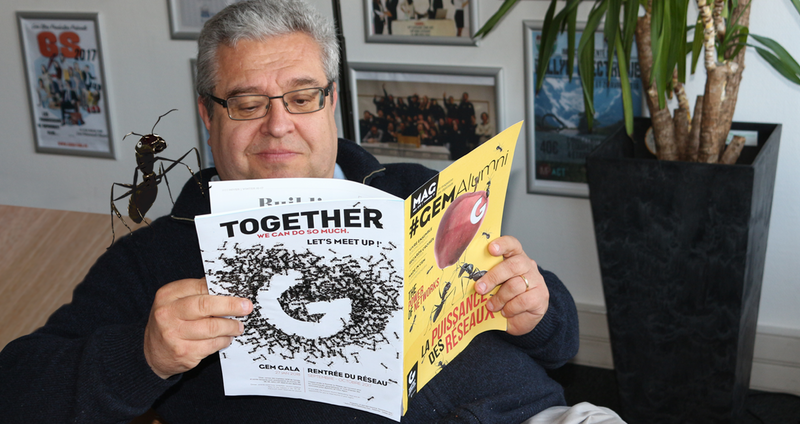 Read the newest edition of the GEM Alumni Mag! Participate in the Photo Caption Contest! To participate, submit your clever caption by commenting on the original post on GEM Alumni Facebook page. Entries will be accepted in French and English. The GEM Alumni team will select one winner in French and one in English based on wit, creativity, humor and originality. Each winner will receive two tickets to attend the GEM Gala on January 27, 2018. In addition, the GEM Alumni geographic community that has the most participants submit a caption will receive a bottle of champagne to share at their next G.I.T. S.I.T. (get in touch, stay in touch) event ! How’s that for the Power of Networks? Please note, in order for your comment to be taken into account for your geographic community, you must include #GEMAlumniIn(your community). For example, #GEMAlumniInGrenoble, #GEMAlumniInLondon, etc. Don't miss the opportunity to get together and brainstorm during the Summer Alumni Networking Days! The winners will be announced on June 30th at the Pot du Directeur and will be posted on GEM's social media accounts.